Heat Engine - Nitinol Metal Engine driven by hot & cold water. 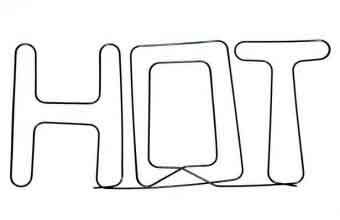 This custom shaped "HOT" wire is a simple way of demonstrating the properties of Nitinol. When the wire is cool, it can be bent into any shape. Drop it into warm water (above 105F/40 degrees Celsius) and it springs back to its original remembered shape, spelling the word 'hot'. Allow the wire to cool and the experiment can be repeated. This fully assembled Nitinol Heat Engine works like an engine without any visible power source. As a shape memory alloy, the Nitinol wire reacts to small changes in temperature converting low temperature thermal energy into mechanical energy and driving the engine as it tries to return to its "remembered shape". The wheels of the Thermobile will continue to spin as long as it remains heated. To start the engine, simply immerse the edge of the smaller pulley into a water bath between 45 and 90 degrees Celsius and spin the larger pulley. 8" long x 1" thick, 4 oz. Clear acrylic handle with aluminum pulleys and looped Nitinol wire. 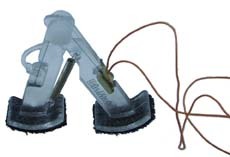 BioMetal Fiber Walking Robot. This walking robot uss a small length of BioMetal Fiber. 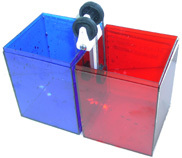 Place the walker on a non-slippery flat surface. Press the switch on the battery case for about 2 seconds to widen the leg angle. Release the switch to make the legs return to original position. Make the robot move forward by repeatly pressing and releasing the switch. Weighing in at 4.2 grams, NanoMuscle Rotary shape memory alloy actuators are now available from Images SI, Inc. These spring-loaded rotary muscle wire actuators provide 60° of rotation using the linear NM70-Super nitinol actuator, encapsulated in a body with a cam-action rotary output shaft. 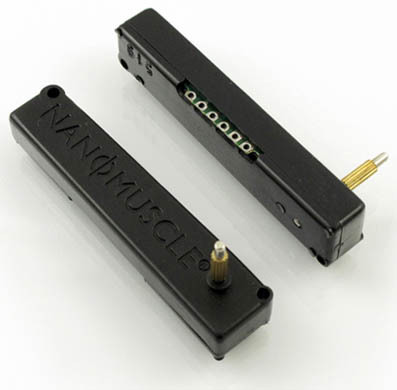 Operating voltage ~3-6V.The rotary NanoMuscle memory metal actuators come in two different versions, the 2-pin NM70R-2P listed here, and 6-pin NM70R-6P listed below. MOSFET driver is available for controlled actuation. 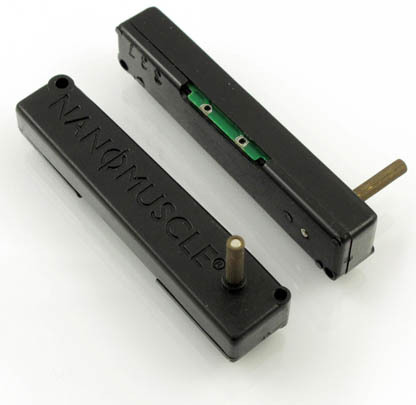 Weighing in at 4.2 grams, NanoMuscle Rotary shape memory alloy actuators are now available from Images SI, Inc. These spring-loaded rotary muscle wire actuators provide 60° of rotation using the linear NM70-Super nitinol metal actuator, encapsulated in a body with a cam-action rotary output shaft. 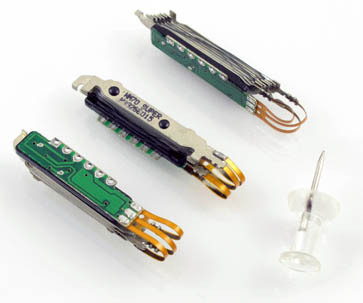 Operating voltage ~3-6V.The rotary NanoMuscle memory metal actuators come in two different versions, the 6-pin NM70R-6P listed here, and the 2-pin NM70R-2P listed above. 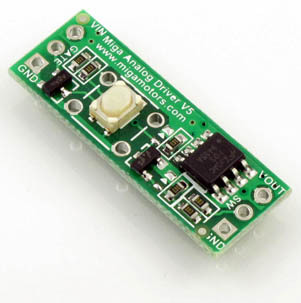 MOSFET driver is available for controlled actuation. This MOSFET switch is designed to safely power the NM70R-6P shape memory alloy actuator across a wide range of speeds or input voltages. It allows either push-button control, or external Gate or CNTL signals (from 2.5-30V) to actuate the NM70R-6P memory metal actuator until the end-of-travel is reached. It then cuts power momentarily, preventing overheating of the shape memory "muscle" wires. Nitinol demonstration of long life and durability, butterfly gently flaps its wings, beautiful lifelike motion makes it a great gift as well. Uses wall transformer for power (included). Compression Spring ­ When cool, can be pressed down to 16 mm ( 5/8" ). Heated with 3 Amps, it extends to 30 mm (1-1/4") with over 4 Newton's of force! 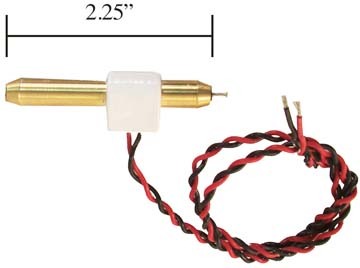 8 mm (5/16") coil, 950 µm (.04") wire, activates at 55-65° C equivalent to (131-149° F). Fun and educational! You can bend it while cold, then heat it in hot water, and it will straighten quite forcefully. You can modify the remembered shape by annealing the wire. For more information Click Here. 10 feet or more @ $4.75 per foot. These 3" samples of memory wire can be wound around a pencil to form a coil. When immersed in hot water, the wire returns to its original shape. The wires can be "set" into other shapes, using a candle flame. These wires have a smaller diameter than our memory wire by the foot. For additional information read our online Nitinol Article. Flexinol® wire's physical function resembles biological muscle; when activated it contracts. To activate Flexinol® it is heated above its transition temperature (typically 70°C). An electric current may be passed through the wire to heat it electrically. The contraction movement may be applied to any task requiring physical movement with low to moderate cycling speeds. The small size, light weight, ease of use and silent operation allow it to replace small motors or solenoids. When the material cools (or when allowed to cool) it can be stretched back it its original length for subsequent contractions. We offer Flexinol® wire in a variety of diameters, from .002 to .015. Flexinol® wire is also is available cut to length and precrimped, see below. We offer low temperture (LT) activation (contraction) 70° centigrade and high temperature (HT) activation (contraction) 90° centigrade, wires. 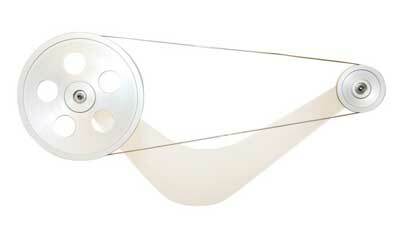 Flexinol® is a trade name for shape memory alloy actuator wires. Made of nickel-titanium (Nitinol) these small diameter wires contract (typically 2% to 5% of their length) like muscles when electrically driven or heated. This ability to flex or shorten is a characteristic of certain alloys which, dynamically change their internal structure at certain temperatures. *Please note contraction time is directly related to electric current imposed. The guidelines are only approximations, since other factors like ambient temperature, air currents, and heat sinking will vary with specific devices. There are two kinds of crimps available: ring terminals and barrel crimps (see diagram below). There is a one time setup fee of $125.00. When calculating your assembly costs remember to add the cost of the Nitinol wire used (see wire price list above). 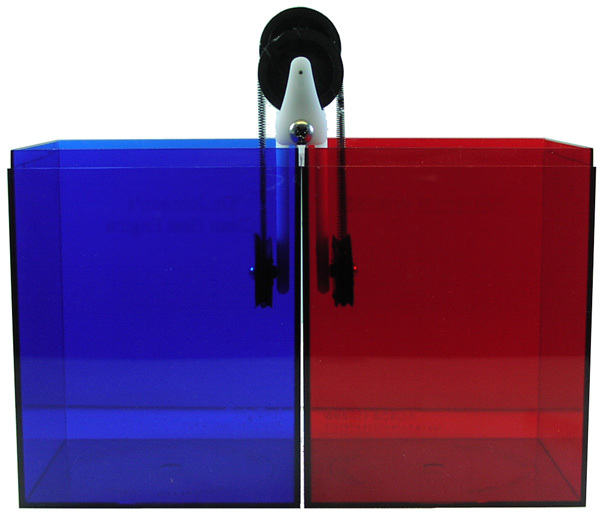 Note: Crimps cannot be sold as stand alone units. Click here to view an illustration showing the method of measuring, for ordering, pre-crimped flexinol® wire. BioMetal Helix Dimensions (.006 x .70) inches. The advantage of the BioMetal Helix over standard Nitinol wire is that it may be stretched and contracted to twice its length. In this case a .75 inch length may be stretch to 1.5 inches. Typical cycle rate at 20°C: per minute. See following 118 KB movie. Includes one SMA coil spring 20 mm long (in contracted state), 4 spectacle terminals, 4 eyelet terminals, instructions. 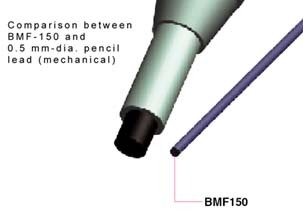 BioMetal Fiber Dimensions .15mm x 1 meter (or .006 x 39 inches english). The BioMetal Fiber is a fiber-like actuator (drive unit) designed to contract (tense) and extend (relax) like muscles. The key feature of this product is its flexible, smooth movements like those of real life. Although soft and pliable like a nylon thread under normal conditions, it becomes stiff like a piano wire and sharply contracts, when a current is fed through it.